My contribution to this weekly "Unportraitable" challenge. When I saw this palette, I couldn't get "Diskor" out of my head, it was perfect for him. 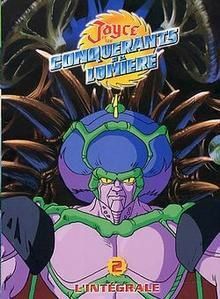 This character is the big villain of one of my childhood's anime series "Jayce & The Wheeled Warriors". Here is a picture used as ref. Jayce and the wheeled warriors! I loved that show when I was a kid! Excellent ! En effet, la palette se prêtait parfaitement au personnage ! Really nice and anthology ^^. Très bon ! Que de souvenirs les monstro-plantes ! I can hear the theme song in my head ... awesome. Just awesome. And yes, in English (America at least) he was called "Saw Boss"! Awesome! I love the wheeled warriors and this art looks good. I seem to recall he was called Saw Boss in the english version. I used to enjoy this show and this is a quality piece.